Each canvas print is signed by the artist and comes with a certificate of authenticity. Measures 30-inches wide x 20-inches tall. 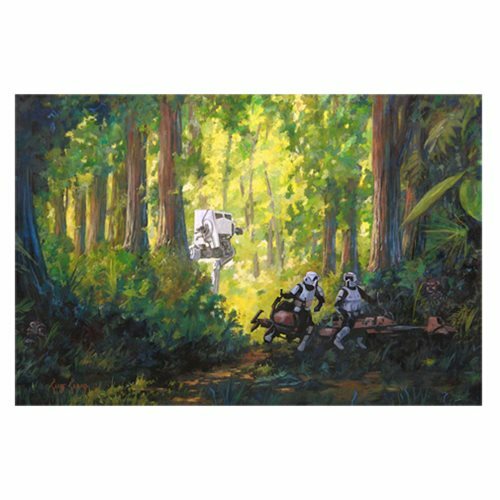 Two of the Empire's finest take a breather in the forest on Endor in this beautiful Star Wars Imperial Scout Troopers by Cliff Cramp Canvas Giclee Art Print. Imperial Scout Troopers by Cliff Cramp features artwork inspired by Return of the Jedi. An unframed limited edition of only 95 hand-numbered pieces, it measures 30-inches wide x 20-inches tall. Each canvas print is signed by artist Cliff Cramp and comes with a certificate of authenticity.